Justin's WeatherTalk: The Chill is on! 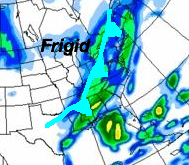 While it looks like yesterday's extrapolation from GFS looks to be too cold, it will be frigid. Partially thank the fact that most of our snow melted, and we will likely end up in the mid 20s instead of upper teens in central Maryland today. However, we can expect some single digits temps in the morning. Good thing it's a holiday and a lot of people will get to sleep in. Here you can see this morning's temperatures. I wanted to highlight some spots. First Football: The 3pm Game New England will not be too bad. 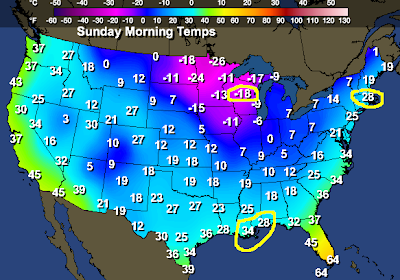 Boston's 28F this morning however was the same temperature as Pensacola, FL. New Orleans was down to 34F. Note: Atlanta Georgia picked up about 1 inch of snow- but a lot melted on warm ground. This evening game in Green Bay, WI will be the dangerous one. This morning's temperature ranged from -15F to -20F in northern Wisconsin. Kickoff temperature will be around 0F, with -15F wind chill. That means frostbite can develop in less than 15 minutes. While it might be fun to watch (the Giants win) on TV, it will be dangerous for players and fans. Tomorrow the beard gets shaved.... but winter is just getting started. Just a quick peak at Tuesday from the Canadian. A cold front will try to reinforce our cold air, and bring us some showers. Right now it looks like snow and or rain showers... but may have the potential of an inch of snow. A series of cold fronts will move through during the week, with a chance of a larger short wave storm next Sunday. More on this Monday.